The most requested song on hospital radio in the UK in 2014 has been revealed as Happy by Pharrell Williams. The song pushes My Way by Frank Sinatra down to number 2 after nearly a decade at the top. 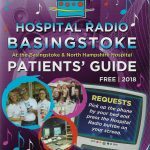 The chart is compiled from thousands of requests collected by hospital radio stations all over the UK and presented annually by Mark Snowdon. Abba were number 3 and Johnny Cash was at number 4. The chart will be repeated next Monday evening at 10 here on HRB.